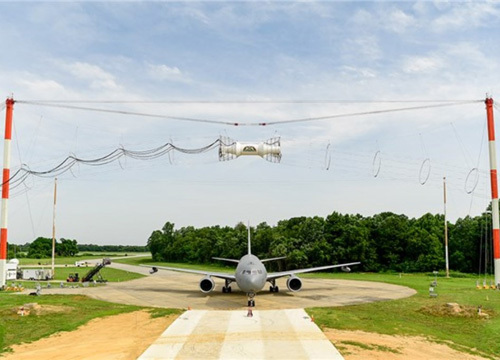 A Boeing-led team, including U.S. Air Force and Naval Air Systems Command representatives, recently completed KC-46 tanker electromagnetic testing. “The KC-46 tanker is protected by various hardening and shielding technologies designed into the aircraft to negate any effects on the aircraft. This successful effort retires one of the key risks on the program,” said Mike Gibbons, Boeing KC-46 Vice President and Program Manager. Testing was conducted on the Naval Air Station Patuxent River, Md., electromagnetic pulse (EMP) and Naval Electromagnetic Radiation Facility pads and also in the Benefield Anechoic Facility at Edwards Air Force Base, Calif. The KC-46A is a multirole tanker that is designed to refuel all allied and coalition military aircraft compatible with international aerial refueling procedures and can carry passengers, cargo and patients.